My life as a sitcom part 2! My hubby has the dubious honor of spending a few nights a week with my parents. It works out well for all of us. He has a homey place to stay while away, my parents enjoy his company and my siblings and I appreciate the weekly check-in on the folks. It is also the source of much humor. Disclaimer: anyone reading this who knows or comes in contact with my parents..Keep the secret..teehee..siblings and cousins this means YOU! 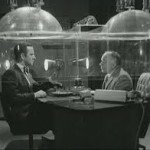 Before I begin let me lower the “cone of silence” with a tip of the hat to that 60’s sitcom “Get Smart” and assume you all can keep a secret, especially those of you who actually know my parents. Mom…guess what Paul? I have news! We are now part of the Neilson family. Paul scratches his head and thinks to himself..who are the Neilsons? Do I know these people? Mom: Look, we have a box attached to each TV and every time we watch we have to click this remote ( oh man, just what my parents need, another remote) and it tells the Neilsons what we watch. 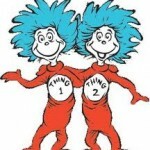 Does this remind anyone of Dr. Seuss.. Thing 1 and Thing2 ? More puzzled looks from Paul since he watches whatever they are watching and endures the maximum volume possible allowed to boot. Mom “we were SELECTED” This was said with great pride. Okay..well do they compensate you for it? Dad “why yes we got a Cherry Pie” mmm “Oh and a small stipend” Evidently the stipend is super top secret because he would not say how much. What a good deal for those guys. I am sure Mom fed them and maybe even sent them home with food. They did have to endure anti inflammatories Dad’s jokes since he had a new audience and try and install this stuff on my folks antiquated televisions. They earned their wages for sure that day. Paul was patient as Dad explained the whole process to him. He couldn’t help but ask, so what happens if I watch TV with logging in? Does a death ray emit from the TV? mmm, maybe there is a death ray or at least an electric shock, who knows. Early the next morning Paul procured a plastic container and lid from my mothers collection of at least 1,000. She never met a plastic container she couldn’t keep. He got the cherry pie out of the frig to take a piece for lunch and there on top of the pie was a note in Dads handwriting. I forgot to tell you…keep the Neilson stuff a secret..mum’s the word! Kudos to Dad for putting it on the cherry pie. Paul never met one he couldn’t resist. I could have saved the “Neilson family” alot of time and trouble. Here are the shows Mom and Dad watch: Anything with a talking head or pundit ( with election season there are just too many to list) NCIS ( Mom’s fav) PBS and the history channel. If they hadn’t canned “As the World Turns” that would be on the list as well. Oh and so much for demographics. I guess advertisers really want to know what the octogenarians are watching these days. Now remember its a secret. Perhaps Mom is thinking if they excel at this the Neilson family will invite them for dinner or maybe she’s afraid there really is a death ray. Oh my. I’ll bet if we all got together and traded parent stories we could make a fare wage at the networks as “Idea” people. I am hoping none of my kids start to blog about us. I really wanted to run it and have it be my very first ( and possibly my one and only) marathon. I was tempted to register for it again today especially when I saw it was 98% full about an hour and 15 minutes after registration opened. I knew it would fill up fast but this must be some kind of record! Turned out it was. The 30,000 online registration spots were spoken for in 2 hrs and 41 minutes. Wow. Even though I know it was the right decision I still am a little sad that I am not one of those 30,000 runners who registered today. And I am a little relieved. I still want to run a marathon but I am happy to not have the pressure of training for it right now. I am slowly increasing my running mileage and getting back into a regular running routine. My first official race will be a 10k at the end of the month and if I am smart I will listen to my body and run/walk it. Not only will I need to listen to my body but I will also need to swallow my pride as well. Something I was not willing to do last year for the marathon. Yes I didn’t run it because I needed to rehab my back. That was a smart decision. BUT the rest of the story is the part I need to own. 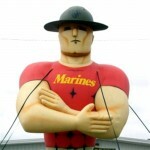 I realized early on in my training that I would need to run/walk the marathon. I read a couple of books and decided it was my best option. If my back hadn’t gotten in my way and prevented me from running the marathon then truthfully I believe my head ( my stinking thinking) my pride and my fear of being judged would have done me in. Even though I was doing fair in the run/walk training despite my back I couldn’t get the picture out of my mind of how it would look to run/walk the marathon. I saw myself running for a set number of minutes and then walking for one or two minutes and being embarrassed ( esp at the beginning of the race) as everyone passed me by. Now I am embarrassed that I actually let this limiting belief get in my way. I have been a spectator at this race two or three times when my husband ran it. I saw the beginning, middle and end and I NEVER saw anyone walking in the beginning. There probably were people walking I just didn’t see them. And even if nobody did, there is a first for everything. After all my whole goal was to finish. Actually my goal was to make it over the bridge in the time alloted so I could finish the race and not be picked up by the “stragglers” van. So I often wonder if I hadn’t had to bow out because of my back would I have been able to step up to the starting line and run my own race, my way?? It wasn’t until recently that I was willing to own the “head” part of my story. My whole being minus the negative thinking is now ready to run a marathon however I choose to run it…run, walk, skip, moon walk..its all good . No pressure here..not even with the registration, although I will register soon. I will keep you posted periodically on my progress as well as a couple of triathlons I am hoping to do. Honestly I already feel victorious. Owning my true marathon story is more than half the battle. You know me..I have to tri! Why Facebook is alot like riding in your car. Yes I am on Facebook. Yes I have a love hate relationship with it. I love connecting with friends I might not see, offer love and support during trying times and laugh at everyday mishaps. And yet some of my friends post things that make me scratch my head. So why is facebook like riding in your car? Take a good look at your car and tell me what you see? Wait..stand outside and look at it. Less stress that way because it won’t remind you that you really need to clean it out or maybe I am the only one that feels like my car sometimes resembles a rolling trash can. So whats my point and how does it relate to Facebook? For SOME reason we forget there are windows in our cars that OTHER people can look in and see what we are doing. For SOME reason we forget that ALL of our 200, 300 or 1,000 facebook friends can read our posts. AND I don’t care how great your privacy settings are..friends of friends, future employers and most anyone you DON’T want to read your posts really CAN see them…believe me I am not tech savvy enough to know how but I KNOW they can and do. I expanded them and just thought I would share and maybe you all can share your favorites. 1. When I am in a bitchy bad mood .. I stay away from the keyboard and actually FB in general. No one really wants to read my cranky pants posts and I am certainly don’t want to read posts about how great your life is when I am unbelievably crabby. Its NOT okay to post that you love having your kids home for the 10th day in a row when you are really going stark raving mad, out of wine, pms’ing and the hubby is out town to Florida no less and you are going to clear the snow for the bus yourself if you kids say “we’re bored, hungry, … one more time. So just as a side note..if I go a long time without posting just assume I am either without a web connection or in dire need of an attitude adjustment . Translate that how you will but it sometimes involves liquid encouragement and my friend master card or just a good chat with my BFF. And I hate to say it because some of you will gag..but a good run, workout or bike ride. 3. Photos…post only flattering ones of your friends and family. You may think its funny to post that really awful photo of your sister or friend but payback is right around the corner. Let’s go easy on the travel photos. Less is more. New babies? More more more. Nothing sweeter. 50 photos of Mt Rushmore..not so much. 3a. If you tag me in a really awful photo of myself and I untag myself ( yes you can do this and its wonderful) do not keep retagging me. One its just annoying and two..maybe you are really a frenemy and not a friend??? 4. Absolutely NO photos of gaping wounds( seriously) or giving birth ..I mean actually giving birth. This is coming from a nurse who gets to see the miracle of birth on a regular basis but trust me..those photos are for your viewing only. 5. Hateful posts..if you wouldn’t say it the persons face then it doesn’t belong on Facebook..in a bad mood? See rule #1. 6. Letting everyone and the world know you are away. I have heard although I have not checked it out that there is a website called “Rob my house” and it features ways to rob people they know are on vacation via..drumroll…their Facebook posts!! Pretty much a no brainer. Might as well leave the key under the mat for them and a light on. 7. I was never happier then when I learned how to hide all those Farmville requests and now any game requests. I have nothing against them except they were annoying and I was tempted to find out and possibly join but I knew I would get addicted. I can manage to fritter away my time on my own quite nicely…any help in this direction is not needed. Currently I am avoiding Words with Friends….because I know I would love it and be good at it as well. 8. Actually as of the moment those are all the rules I have. I am sure I will come up with a few more. Feel free to add any you might have in the comments section. Coming soon to a post in this blog..the ” do’s and don’t’s of conductiog “business” in Starbucks and Panera’s otherwise known as “get a real office”. Off to check facebook 🙂 as in See Jenn Tri to waste more time!